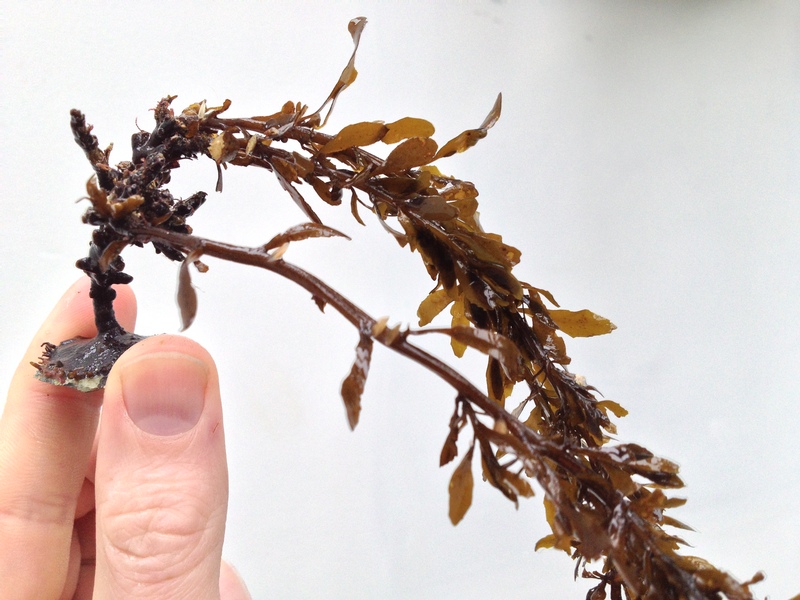 After some musing on animals that I had good- (here and here) or bad (here) experiences with during the past year-and-a-bit that I have my aquarium, I thought it would also be good to take stock of my experiences with seaweeds. 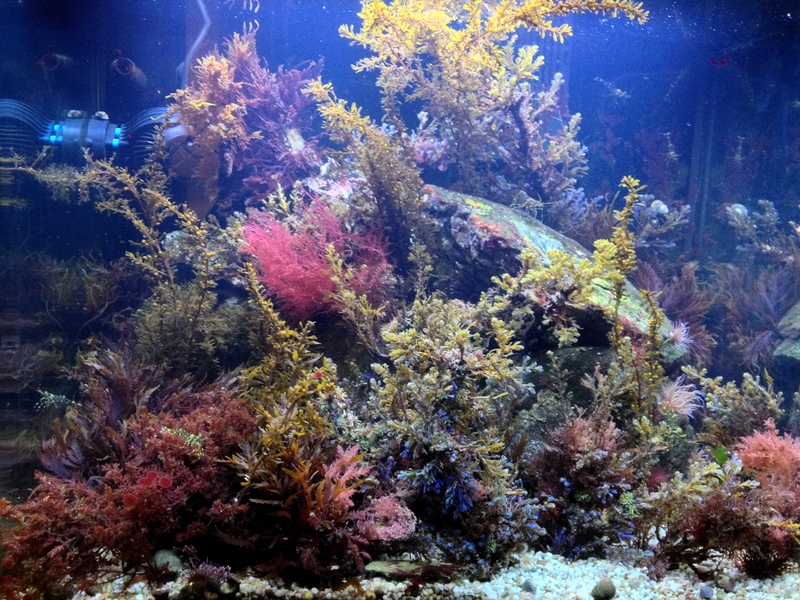 Not many people have temperate marine aquariums, and only few of those who do seem to focus on seaweeds. That is understandable, because it is hard keeping seaweeds! I currently have almost no seaweeds in my tank, as I wanted a break from the problems I had with die backs and resulting detritus. Below a picture of my 130 liter aquarium at its prettiest (see this post); unfortunately it did not look that way for long (see this post): Although keeping seaweeds in the aquarium is difficult, they are so beautiful, diverse and abundant that it is definitely worthwhile to try. The range of shapes and colors is much greater than that of the vascular plants in freshwater tanks. Also, the fact that so few people seriously try to grow different seaweeds in their tank makes it an extra interesting challenge. My fellow aquarists reading this will agree that it is great to look at a ‘finished’ tank, but building it up and experimenting to ‘get it right’ is an integral part of the fun. Keeping a native tank means that you can collect yourself which is a great activity in itself (and free). being able to observe organisms in their own habitat also gives you some clues on how to best keep them in the aquarium. Anyway, below my personal- and somewhat disjointed thoughts on the topic of keeping seaweeds in the aquarium (with some links to previous posts). Quite a lot to write about so I’ll save some pondering for a part II. Coming back to the same rock pools over the course of the year, it is very striking to see the composition of seaweed species change. Some species are annuals and always there (although sometimes somewhat overgrown and smaller), but many species are only abundant for a season or even less than that. For example, Dumont’s tubular weed Dumontia contorta was abundant only in early spring this year, whereas Codium tomentosum has just appeared now and will disappear come spring. This must be due to adaptation to annual variations in temperature and daylight (and competition with other species that are present in different months). 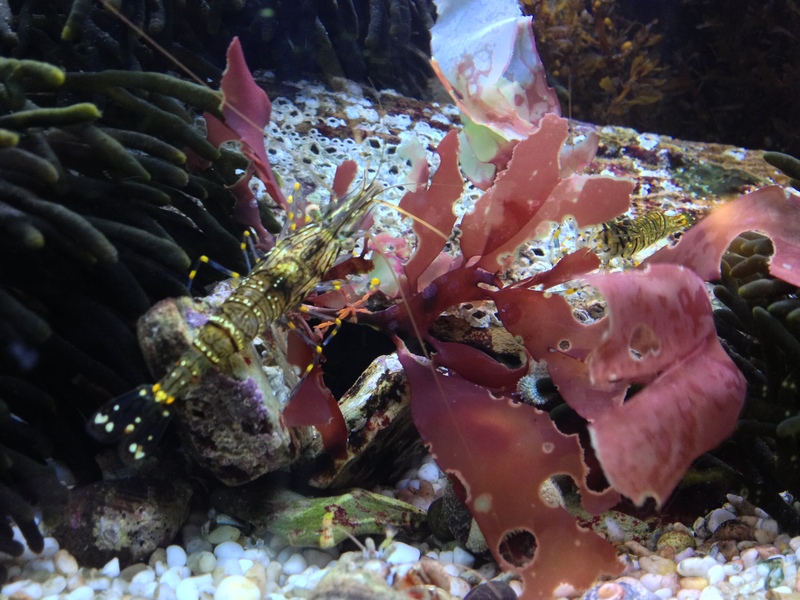 Although light and temperature conditions can be kept constant in the aquarium, seaweeds are likely ‘programmed’ to thrive at specific times of the year. So in contrast to fresh water planted aquariums where plants just grow and need occasional trimming but otherwise stay the same, marine planted tanks never stay the same. A good example of how a tank can change over time is the series of monthly pictures taken by Jon Olav of his Norwegian native aquarium. I guess for some people, the unpredictability of seaweeds is a downside, not an upside. 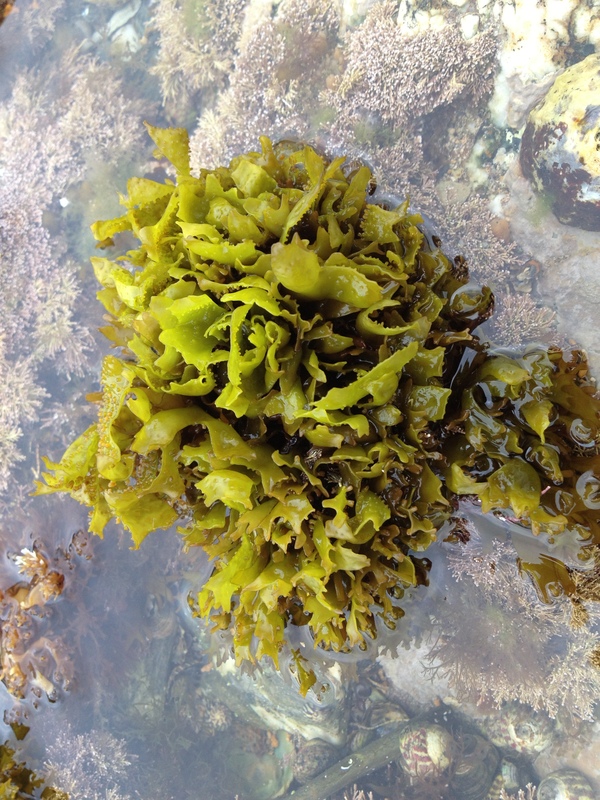 Herbivores, such as snails or prawns can start munching on some seaweeds, especially flat greens and reds seemed vulnerable. Perhaps if you provide enough food, they will leave the seaweeds alone (but you risk overfeeding and the disasters that come with that of course). 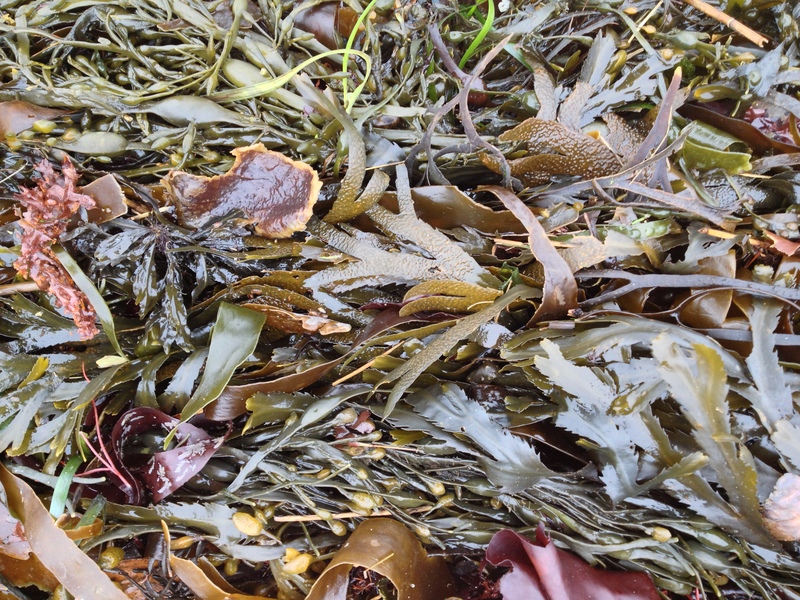 If you are really into your seaweeds, you could also choose to ditch such critters. This entry was tagged Grape pip weed, Irish moss, Mastocarpus stellatus, planted aquarium, seaweeds, Solier's red string weed. Bookmark the permalink. hey, no, they will just rot and make a big mess!